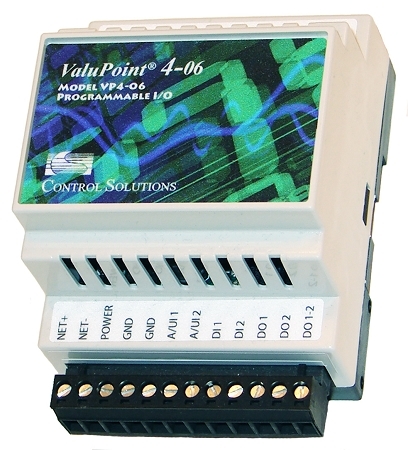 ValuPoint Model VP4-0630 Programmable I/O for BACnet MS/TP provides slave I/O, includes user programmable control, 2 analog/universal inputs, 2 discrete inputs, and 2 relay outputs, with all I/O accessible as BACnet objects. Control Solutions’ Model VP4-0630 ValuPoint® Programmable I/O for BACnet MS/TP is a BACnet Application Specific Controller (B-ASC) that includes programmable control. The VP4-0630 is a scaled down, low cost version of the VP4-2330 featuring 2 universal inputs that may be configured as analog or discrete, 2 dedicated discrete inputs, and 2 Form A relay outputs. The ValuPoint VP4-0630 is useful as slave I/O or as a very small soft PLC. The ValuPoint® series of controllers is designed to be a building block in a distributed control system where controllers communicate peer to peer via BACnet MS/TP. Each ValuPoint controller can access BACnet objects in other BACnet devices, both ValuPoint controllers and other manufacturer’s devices. Remote objects are mapped to local objects that mirror the value of the remote object. Access to the remote objects is via periodic polling. Other devices can subscribe to COV’s in the ValuPoint controller. All of the ValuPoint features available to local objects are also available to the remote mapped objects. This means the remote objects can be incorporated into the local i.CanDrawIt® program. ValuPoint® support software, available for download at no cost, includes the VP4-0630 configuration tool, i.CanDrawIt graphical programming tool, and the pliWrite line programming tool. Both programming tools support both simulated execution and live debug. The tools connect via a BACnet IP to MS/TP router, or via Control Solutions’ MTX002 USB to MS/TP adapter. • 0.2A @ 24VDC max.